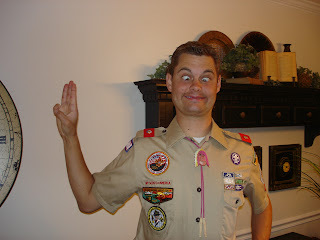 Mike is off to scout camp in the morning for a week and boy is he excited! 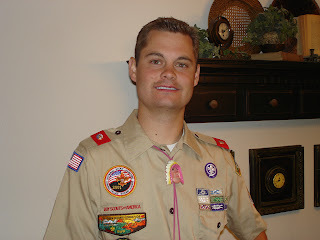 He got all dressed up in his scout uniform tonight to make sure everything fit properly. Tonight he plans to sleep in his uniform so he'll be all ready to go in the morning j/k....he's not that big of a nerd...but getting close. There's nothing better looking than a man (especially my man) in a uniform. I'm so lucky to be his wife! This will be my first time living as a single parent and it'll be for an entire week! We'll see if I survive. Wish me luck!